Your wedding will be a joyous day in your life, but it can be difficult if you've lost someone close to you and they cannot be with you to share your day. 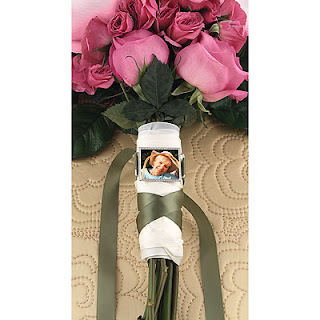 We love this photo memory bouquet buckle because it enables you to hold someone close and carry their memory down the aisle with you. Truly a beautiful tribute to someone who has meant so much to your life. 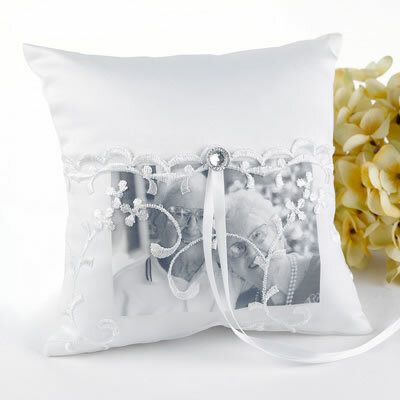 Another personal way to memorialize a loved one at your wedding as you walk down the aisle is with a soft white satin ring pillow. The one shown here has rhinestone accents and satin streamers, and has a beautiful lace-trimmed pocket for inserting your cherished photo. 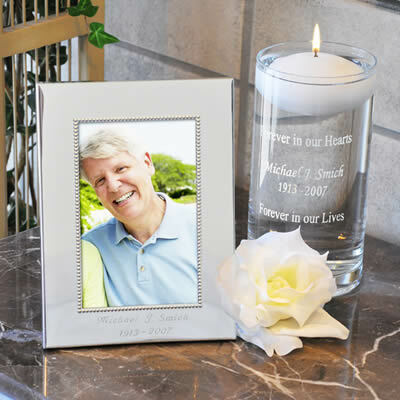 If you prefer to use a memorial candle, a floating memorial candle & frame set is a special way to honor your loved ones. A lovely wide glass vase is engraved with the words “Forever in our Hearts... Forever in our Lives” across the top and bottom. A personalized name and date can be engraved in the center of the vase and along the bottom of the frame. This a touching tribute during the ceremony, but also becomes a special treasure for years to come. Paying a special tribute to a loved one who has passed is a uniquely personal decision. You know your relationship with that person best, so don't worry about what anyone else thinks or says. Whatever you decide to do is going to be absolutely perfect for you ... and that's all that matters.